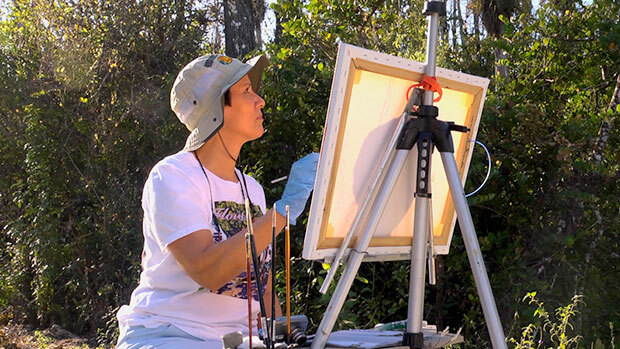 Carol McArdle chose to paint from the Loop Road in the Big Cypress Preserve because it is fairly close to her home in Southwest Florida and because of her fondness for the ferns, pond apple trees, pop ash, bromeliads and other foliage in the cypress stands. And the birds! The Greater Everglades Conservation Atlas was a place-based art project that mapped locations in the Everglades through the artists who live and work there. By meeting and interviewing artists and spending time with them in the field, the Atlas created a multimedia experience — shared in a “Geostory” – taking viewers to Big Cypress Swamp, the Lake Wales Ridge, Rookery Bay, and other scenic and ecologically important locations in the Greater Everglades watershed. GeoStories combine interactive maps, geo-tagged multimedia content, and text. In a partnership between The Legacy Institute for Nature and Culture (LINC) and National Geographic’s Maps Division, the story of the Everglades is told to the world to increase watershed awareness and foster stewardship. Users of the Atlas can experience the Everglades in a virtual on-line gallery featuring ten of Florida’s most skilled visual artists.You can experience the artist’s interpretation of each unique spot on the map and other information about the location in each self-contained geo-story. As visitors tour the art locations, they will find interactive stories complete with natural history, cultural briefs and conservation information.